Mulch – one of the agricultural engineering measures to protect plants and soil from the adverse impact of temperature and drying as well as to enrich the soil and prevent weeds breed. Tomato is very valuable vegetable. It contain soluble sugars, organic acids, cellulose, pectin, protein, fat, minerals (potassium, phosphorus, sulfur, magnesium, calcium, iron, copper, sodium) is rich in vitamins (B1, B2, B3, PP, C, A, I, H) and has alkaloid tomatine possessing phytoncide properties. Remontant strawberries fruit all summer, but not so richly as ordinary species. 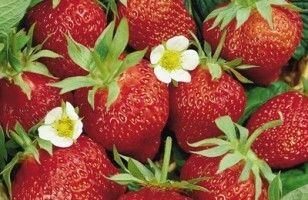 Strawberries grow best in open, sunny place with prevailing fertile, loose, permeable to water, gently acid or neutral reaction (pH 5,8 – 6,5) humus sandy and loam soil, where the ground water is not higher than 0,7 m from the surface.